Although, I don't know that I'd be much help at the moment, seeing as I got very little sleep due to coughing, so we might just fall over together. K? K. It'll be good times. HA! Ohhhhh....that's not the kind of 'leaning' this sentiment is talking about, is it? Ooopsies! In that case, I'm totally here for ya, babe! And let's be honest...If you do need me, I probably have candy and candy always helps! It's Friends With Flair Friday over at Unity and this is my card for today! I used the Family Dynamix set from Bella Blvd. This set is so stinking adorable! I inked the stamps with Momenta Tuxedo Black and Bamboo Leaves ink. The tree is watercolored using the same Bamboo Leaves ink and a water brush. It's a happy tree. Just say'n. And the twine...now that was just plain fun! I wanted something simple, but not just twine going across the card...that wasn't enough, so I decided to create a little twine bundle (this is Orange from Whisker Graphics) to finish off my card. I LOVE IT!!!! And that beautiful orange cardstock is from DCWV! It's their creamy cardstock and it is so pretty! I love it! Well, off to the races! I am SO glad it is Friday, can I just say that? No. For reals. I can't even begin to tell you. So glad. Just say'n. I hope your Friday is super fabulous and if you are at work I hope that part goes by super speedy! Happy Friday, folks! Your cards are ALWAYS so cheerful! Kinda like YOU! And, while I so seldom jump on the craft or craft product-of-the-moment bandwagon, I admit I have become totally addicted to twine. It's ridiculous how much I've bought in the last month or so. You ARE responsible, you know! LOL! Seriously, I LOVE the stuff! It's SO multi-purpose & FUN! Hope your mean old cough goes away FAST & your work day does as well! LOVE YOU TO TWINE-TIED PIECES, Lil' Jen! LOVE the twine bundle and the green/orange color combo. It totally works! Hi Jennifer! Happy New Year!! 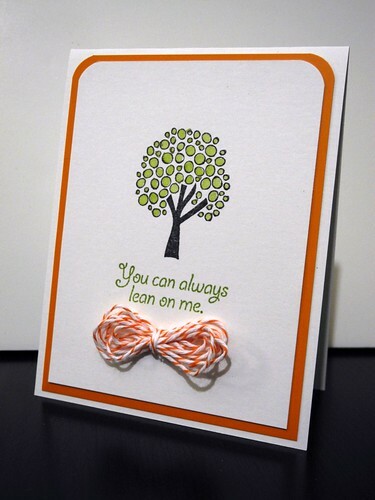 What a cute card, I really love the tree and the twine bow!! What a fun use for twine! Love it. Cute card with awesome colors! great card and i love the added twine bundle! Hope you feel better! That card is really nice! Cute, love the twine bundle too! So cute. I'm thinking I Need some twine. Hope you're feeling better SOON! I think that coughing is the WORST!!! beautiful.. love the baker's twine for the pop of colour.. gorgeous!! Great card, I love the CAS design with the pop of FUN from the twine bundle :) Hope your coughing subsides so you can enjoy your weekend! Cutie!! Great CAS and happy colors! The tied bakers' twine is the cutest of ideas. very nice card great color too. Very cute and the twine bundle is adorable. an amazing card, love it, so adorable. Very cute, love your colors and that twine bow! This is simple yet adorable. Thanks for sharing. FABULOUS! I just love how clean this is. The colors pop right off the page! I really adore that twine bundled bow!!! Such a fabulous CAS Card.....I love your twine bow! Fabulous CAS card! Love what you did with the twine! Awesome card! Love that big ol' bundle of twine and how you rounded just the top corners of your layers -- looks great! Oh how stinkin' fabulous! Clean and crisp! LOVIN' that twine!! This is adorable - love what you did with the twine!!! Adorable!!! That green and orange color combo...one of my favorites! Love what you did with the twine! I definitely need to break down and get some after seeing all the cool ways you find to use it! REALLLY like this one! The use of orange and your corner rounders is so terrific! 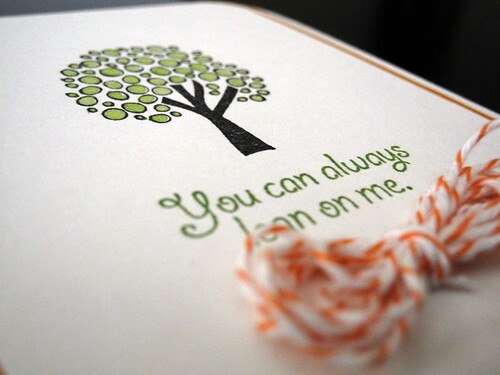 I love this card and love that touch with the twine. Yes, candy always helps! Your card is so fun. The pop of orange, the funky twine bow, the simple layout all work wonderfully together. I like the bow tie of twine! Love that fab tree & twine! Happy Happy New Year! So sorry you aren't feeling well. Hope that cough goes away soon. Loving this cute card - it IS happy. That twine ribbon is so sweet. Very elegant! I just LOVE this! it is a happy tree! and i love the twine! What a wonderful card to get from a friend! awwww love this....and the twine bow...perfect! A totally charming CAS card! Love the bow!